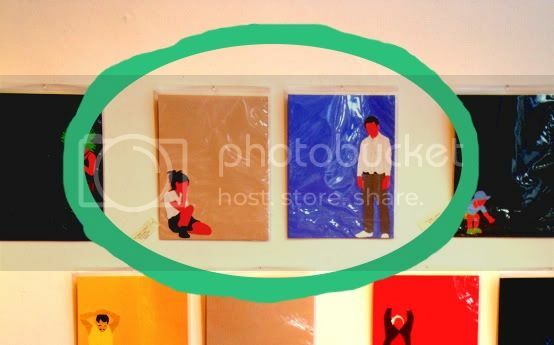 As I mentioned in my last post, I bought some art at the AMG Stimulus Package. I mentioned in an earlier post how much I liked the work of Woody Golden. He's a sculptor, and the work I was responding to were these pieces where he carved a hole into a large book, then took the carved out pieces, laminated them, and sanded them into organic, stone-like shapes--then put them back into the void in the book. I was definitely attracted to this suite of paired pieces by Eric Faggin. The figures are made out of tape, and the red tape is much brighter in person--it's actually fluorescent. Anyway, they all looked great and the pairings were intriguing (often implying a dialogue between young and old, or across cultures, or between people who might be at odds for some personal reason). Here's the one I ended up getting. Finally, I got a piece by Marzia Faggin. I have no idea what relationship Marzia and Eric Faggin have (if any). Google doesn't really turn up much on them. 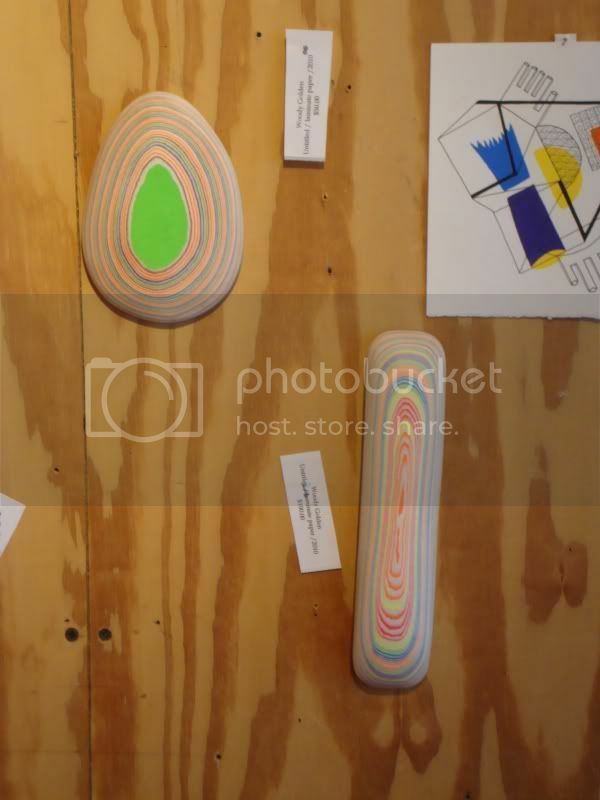 They were both in a recent group show at Poissant Gallery. There is an Eric Faggin who is a designer, but I don't know if this is the same guy. Anyway, as I mentioned in my last post, Marzia Faggin's work goes in a lot of different directions. This is so unlike her paintings it's sort of a shock to think that it is by the same artist. The bullet, wings and flower seem to be glued on and perhaps made of plastic. The ceramic part is unglazed--the colors are paint. (At least as far as I can tell.) 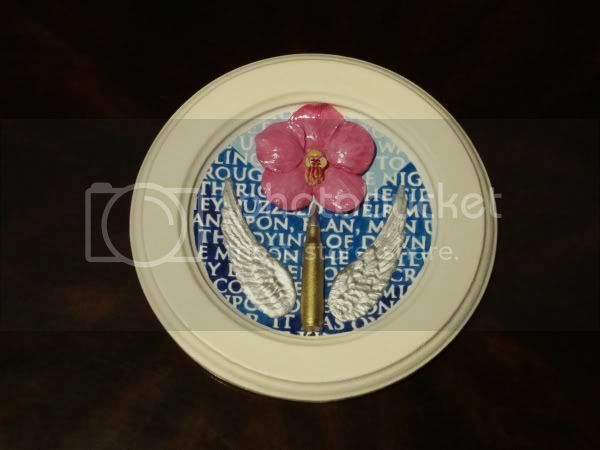 Of course there is a delicious irony in combining the flower and ceramic with the bullet. This aesthetic choice reminds me of the work of Charles Krafft, who makes machine guns and hand-grenades using the ancient somewhat kitschy, little-old-lady-like techniques of Delftware. As I have mentioned before, I have a strong interest in accessible collecting--art collecting for beginners, one could say. I like schemes that bring high-quality art (with the value-judgments and presence of aesthetic gatekeepers that the word "quality" implies) to non-rich collectors. This show is a pretty successful example of this kind of thing. I certainly am happy with what I got--and if I had had more extra money to spend, I would have gotten more! Marzia & Eric are brother sister. She makes her sculptures out of plaster. You are lucky to have her work. She's amazing. She has others similar to the one you acquired. Congrats. Wait till you see her new stuff!